Boiler feed pump articles provides guidance and review about different types, qualities, durabilities, and prices. This pump is used for pumping feed water into the steam boiler. The feed water is the freshly supplied water or the water produced by condensation in the boiler. This feed water is converted into steam by heating. After the steam energy is used up, it is dumped in the condenser. The condensed water is pumped back to the feed tank from where it flows to the boiler again and the cycle continues. The feed water is never released to the atmosphere. Feed water is required for boiler operation. A boiler feed pump must maintain a continuous supply of the feed water to the boiler. A feed pump prevents overheating and damage to the boiler. The boiler feed pump is an essential part of the boiler feed system. Pumps are usually high-pressure units as the suction takes place from the condensate return. A steam boiler is a pressurized tank. To avoid boiler failure and loss of life in the plant, the boiler must have the desired amount of water. To maintain the safe water level standard, a feed water pump is used. 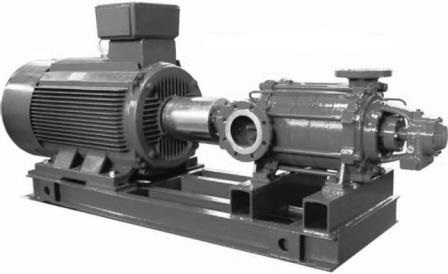 In Boiler Feed Pumps, the electric motor is connected to the pump body by the mechanical coupling. The pump must generate the pressure needed to push the feedwater into the boiler. And the pressure generated must be greater the steam pressure in the boiler. During low flow conditions, the minimum flow is maintained to prevent over-pressuring. In large applications, multiple pumps are installed parallel to each other. The bypass is not required. Can be adjusted as per the steam requirement. Prevent thermal shock to the boiler or the deaerator (if surge tank) by raising the temperature of the feed water. Helps to prolong the life of the boiler system. Achieve substantial energy savings and operating efficiency by raising the temperature of the boiler feed water. They are used to extract water from the condenser and feed them to the boilers. A feed pump supplies feed water to the boiler when required. A boiler feed pump is selected as per the quantity and the amount of pressure required in the boiler. The feed pump raises the pressure of the feed water. The high-pressure feed water enters the boiler due to the pressure difference. The type of the boiler plays a significant role in selecting a feed water pump. Pumping System Design- Pumping system is of two types mainly as direct feed and booster set feed. Direct Feed -Feed water is supplied directly to the boiler. Easy to maintain and simple in construction. Booster Sets - A set of small feed water pumps are connected to a common manifold and are used for producing feed water instead of a single pump. Total Flow Rate Required – amount of feed water to be transferred by the pump and max. flow needed. The flow rate is expressed as Volume per unit time. It is measured in gallons per minute (GPM). Total Pumping Head- distance or height up to which the feed water needs to be pumped in the boiler. Head is expressed in terms of distance and measured in units of feet. Maximum head is the distance at which pump can no longer transfer the water. Material Compatibility – The pump casing and interior trim parts must be checked for chemical and temperature compatibility depending on the boiler conditions. Boiler’s Feed Tank Water Temperature – Pump must be able to operate efficiently in the maximum fluid temperature in the boiler. Some of the prime manufacturers of Boiler feed pump system are Shipco Pumps, Grundfos, Afton Pumps, Inc., Floway Pumps, Flowserve Corporation, etc. And their price ranges from 1000$ to 5000$ for domestic purposes. These pumps costs range from 2500$-7500$. Self-priming pumps are expensive than normal ones. Few multi-stage pumps may cost around 20000$ to 50000$. Mostly industries prefer the design their own feed pump depending upon their application.